There are almost 17 million vending machines worldwide and many of the vending operators are now considering adding connectivity. The author forecasts that the number of connected vending machines worldwide will grow at a CAGR of 18.7 percent from 1.5 million units in 2015 to reach 3.6 million units by 2020. The penetration rate will then reach 20.3 percent at the end of the forecast period. Get up to date with the latest information about vendors, products and markets. This report is available in PDF format only. 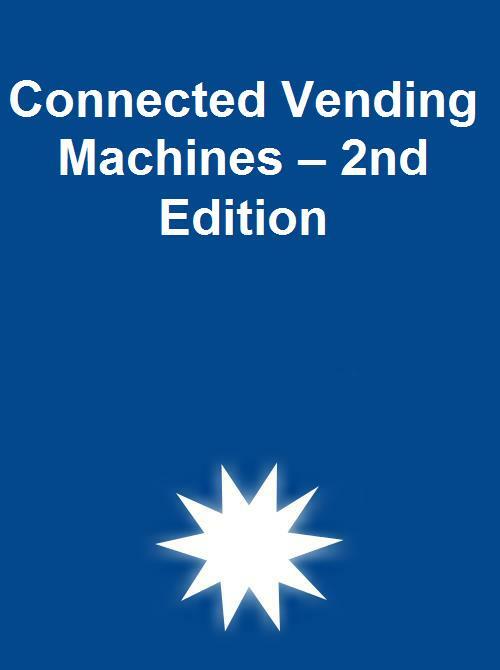 Connected Vending Machines is the second consecutive report analysing the latest developments on the vending telemetry and cashless payment market worldwide. This strategic research report provides you with 70 pages of unique business intelligence including 5-year industry forecasts and expert commentary on which to base your business decisions. Detailed analysis of the vending industry. Updated in-depth profiles of key players in the vending telemetry and cashless payment markets. Perspectives on the impact of mobile wallet services. Extensive global and regional market forecasts lasting until 2020. How many of the world’s vending machines are online today? What is the potential market size for vending telemetry solutions? Which are the leading vending telemetry and cashless payment system vendors? When will cashless payments be commonplace in the vending industry? How will emerging mobile wallet services affect the market? The world’s leading M2M/IoT market research provider, today released a new market report covering the connected vending machine market. The global installed base of connected vending machines reached an estimated 1.51 million units in 2015. North America is estimated to represent around 0.80 million of these machines, whereas the corresponding number for the European market is 0.20 million. The number of connected vending machines in other parts of the world totalled an estimated 0.51 million units at the end of 2015, mainly in Japan and Australia. The author forecasts that the number of connected machines worldwide will grow at a compound annual growth rate (CAGR) of 18.7 percent to reach 3.6 million units by 2020. As a result, the global penetration rate will reach 20.3 percent at the end of the forecast period. Leading solution providers include Crane, USA Technologies, Cantaloupe Systems and Nayax which all have more than 100,000 connected vending telemetry and cashless payment solutions each. The connected vending machine market is currently affected by a number of trends that are foreseen to positively impact technology uptake and innovation among the solution vendors. “The business case for vending telemetry continues to improve in line with technology advancements and decreasing costs of both equipment and connectivity services”, said Rickard Andersson, Senior Analyst, Berg Insight. He adds that cashless payments is similarly a strong driver for adding connectivity in vending machines. Mobile wallet services can enable new opportunities beyond mere payments such as mobile-enabled advertising and marketing programs that can boost customer intimacy. Other recent developments in the unattended vending space include the growing popularity of so-called micro markets. As micro markets are expected to continue to grow at the expense of traditional vending machines, the vending telemetry and cashless payment solution providers will inevitably face a diminishing addressable market in their primary segment. This development on the other hand presents opportunities for innovative solution providers to also cater to the needs of micro market operations. Front-running players such as Cantaloupe Systems have already embraced this opportunity. “Other solution providers are expected to follow suit and increasingly serve the promising micro market segment in 2017 and beyond”, concluded Mr. Andersson.